I don’t really go in for those stickers you see on the back of peoples cars that show the number of people in their families (great way for burglars casing your house to work out if everyone has left because they know how many people are in your family) but I think this particular one is just too cute ... I am seriously tempted to get one! 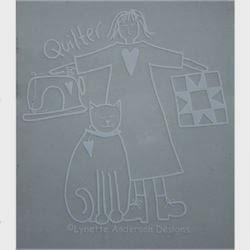 Hi Ulla - just took a peak at your blog page "Ulla's Quilt World" and must say that your work is lovely! Well, I bit the bullet and bought two of these cute stickers - now I just have to clean the glass and stick them on. Actually, I think I'll just put one on the vehicle I drive the most and save the other as a replacement later on. I did ask my quilty friends if they'd like to order one at the same time but didn't get any interest - bet when they see my car sticker they will change their minds, though!